Facilties for charging electric vehicles are now required on all new developments that include off-street parking facilties. In line with the Council’s Low Emission Strategy (adopted October 2012), Air Quality Action Plan and the National Planning Policy Framework (NPPF), developers are now required to demonstrate that they are making all reasonable efforts to minimise total emissions from development sites during both construction and operational phases. This will include ensuring the energy choices for heating and powering buildings are the right ones for both carbon/CO2 and local air quality emissions (NOx/Particulate Matter) and requirements to promote and incentivise the use of low emission vehicles on sites to reduce the overall emission impact of development related traffic (e.g. provision of electric vehicle recharge points). Facilties for charging electric vehicles are now required on all new developments that include off-street parking facilties. The table below sets out the standard provision requirements by development type. [see note 2] At least one parking bay must be marked out for use by electric vehicles only, together with charging infrastructure and cabling. [see note 2] Further dedicated bays totalling 2% of the total provision. Table note 1 – electrical socket in a suitable location to enable the charging of an electric vehicle using a 3m length cable. The electrical circuit/installation shall comply with the electrical requirements of BS7671:2008 as well as conform to the IET code of practice on Electrical Vehicle Charging Equipment installation (2015). Table note 2 – A free standing, weatherproof, outdoor recharging unit for electric vehicles with the capacity to charge at 7kw (32A) that has sufficient enabling cabling to upgrade that unit and to provide for an additional recharging unit of the same specification. In some instances, wall-mounted charging solutions may be appropriate; this should be discussed with City of York Council. 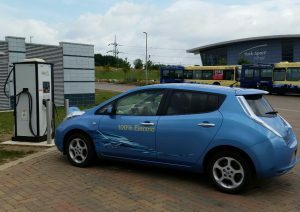 The exact number, specification, location and maintenance schedule for electric vehicle recharge points should be agreed with City of York Council at the earliest opportunity. It should be noted that the standard provision outlined in the table above may also require installation of groundwork/passive wiring at the outset, in order to enable further installation to match demand in future years.